Due to its lack of oil reserves, Israel is completely dependent on expensive oil imports. In light of the country’s rapid economic and population growth, it has become challenging to supply its own peak electricity demands. These challenges are inspiring Israeli researchers and entrepreneurs to work on cutting-edge renewable energy technologies. It has led the government to introduce feed-in-tariffs, for large-scale solar power plants and for PV systems up to 50 kWp. That is in addition to the very successful use of solar water heaters by 95% of the households in the country. Based on decades of Israeli experience in the field of renewable energy and recognizing the strategic importance of alternative energy technologies for the economic growth and prosperity in Africa, the Trade Office of the Embassy of Israel has put great emphasis on building platforms that would enable know-how sharing and technological cooperation between Israel and Southern Africa. We believe that international cooperation is essential for keeping Israel’s renewable energy industry at the forefront of the global arena. There is a lot of talking about solar Water Heating (SWH) in South Africa. Israeli companies not only talk –They deliver. The Israeli company Elsol with its local partner Kayema Energy have shown that SWH installation is not rebates dependent and that the private sector chooses SWH as an energy and cost saving solution. Deputy Minister Enoch Godongwana and ambassador of Israel, Dov Segev-Steinberg, inaugurated a project implemented by Elsol and Kayema on the rooftop of the Da Vinci Legacy Hotel in Sandton. The project includes 117 solar panels that save up to 60% of the hotel’s expenditure on water heating. The inauguration was the first in a series of events organized by the Trade Office for the visit of a delegation of Israeli energy related companies to South Africa. The delegation included 7 Israeli companies: Chromagen, Nimrod Industries and Elsol in the area of SWH; Siemens Solar technologies, a world leader in the field of concentrated solar power plants; Ducool, an innovative company in the field of green and energy efficient air conditioning systems; CQM, a pioneer of a tube cleaning system for power plants; and Isoterma, with an energy saving solution that controls electric geysers. The companies met more than 120 potential partners in South Africa and decision makers within the government and the energy sector locally. 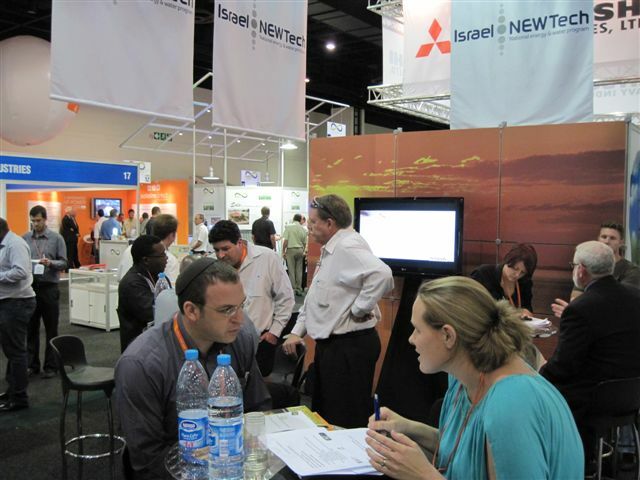 Israel Newtech, The Israeli pavilion at the exhibition Power & Electricity World Africa was the most impressive national pavilion and one of the most outstanding at the exhibition. Mr. Ze’v Groos, Head of Resources Infrastructure at the Ministry of National Infrastructure of Israel, joined the delegation and gave a series of lectures and met local senior decision makers to share with them the Israeli experience. Israel and South Africa face similar challenges and go through similar processes of adopting renewable energy policies and solutions. The two countries are ready to further develop their relationship towards cooperation on renewable energy.